Despite all the games featured in this list being shmups, they are all very different. In a sense it is similar to people who consider themselves dog people. There are all sorts of dogs in all sizes and colors, with different hair and different behavior. But this isn’t about dogs, is it? Just like dogs, shmups come in very varied shapes and sizes, and despite all of them being part of the genre, they offer their own unique beauty to behold. Sky Force: Reloaded’s beauty is present in a lot of things, but what wraps it all together is a very satisfying gameplay loop that borders on addiction. Despite shmups being born from arcade origins, there is something great about diving into the familiar waters of permanent progression. 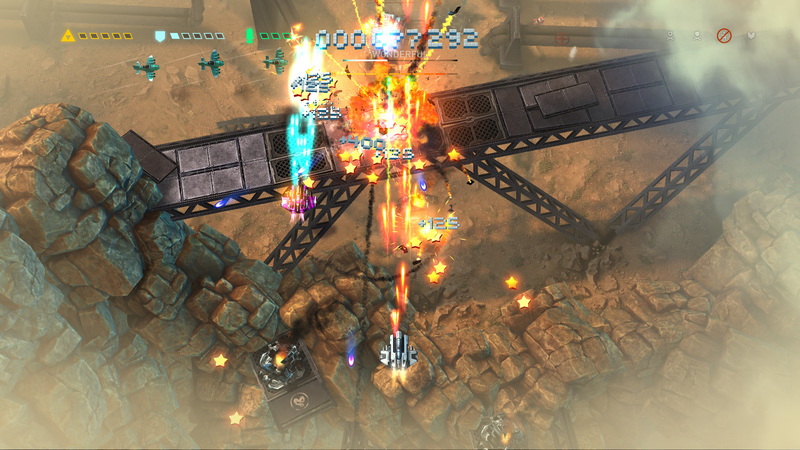 Sky Force: Reloaded is a unique shmup among the catalogue. The gameplay is as basic as you would expect, with you being a ship that shoots and avoids the enemy, who is also shooting. You would be completely wrong to assume this is what this game is about though. While your actual flight time might be as simple as it sounds, all the beauty of Sky Force lies in what you do between missions and how you progress throughout the game. Each stage features an auto-scrolling map filled with enemies that must be (or not) defeated. 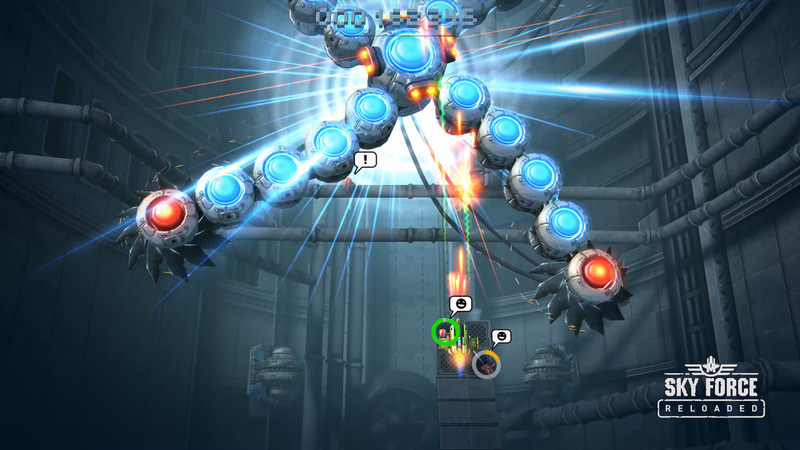 Using a combination of your weapons, you must survive a given stage to the end and fight the boss (or not) before completing the stage. Sky Force adopts an HP system. You only have 1 life, but thanks to the HP you can take multiple hits before going down. You can retry any stage as much as you want, so don’t feel pressured to bring your A-game. One thing to keep in mind is that there is a lack of immunity after being hit. This is more common for platforming games, such as Mega Man or Castlevania featuring invincibility (commonly referred to as iframes) after being hit. The reason shmups don’t usually adopt this, is because 1 hit usually means death. 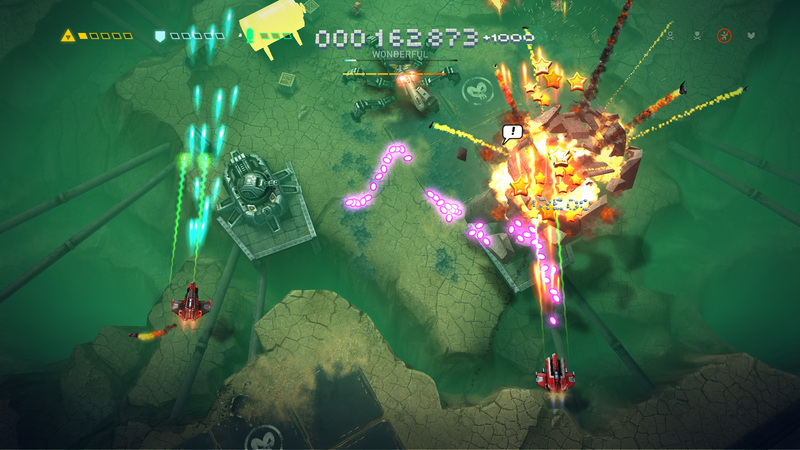 Sky Force features HP, so the lack of immunity means that sometimes… you just die. About half of my deaths felt odd because of this, you can usually recognize when you screwed up and a bullet is bound to hit you, but when the bullets are too many or just weren’t registered by your brain, then you just disintegrate. These deaths are 100% the player’s fault, don’t get me wrong on that, but they all leave a sour taste of unfairness in your mouth when you can’t properly pinpoint the cause of your demise. It might also be because the game refuses to display your HP unless you are being hit or close to being hit, which in my opinions feels like an odd design choice. Beating the stage and defeating enemies will earn you stars. But what ARE stars? Well, I’m glad you asked! Stars are your main currency which is used outside of the levels for a variety of things. At the heart of this game, lies the ability to upgrade your ship’s capabilities using stars. You can upgrade various aspects of your ship. The upgrades include health, main cannon, side cannon, homing missiles, magnet and even special items such as the mega bomb. If you are thinking that this is already featured in other games in the way of in-stage powerups or items, well, you are actually right. The difference is that Sky Force presents you with a long term plan for attaining full power, and a permanent one at that! While it might not seem like it, being able to permanently power up makes all the difference in the world. Rather than focusing on not dying to preserve your power, the game changes into one of try to acquire as much currency to be able to afford those expensive upgrades. Entering a mission with the goal of collecting enough stars to power up your main gun becomes a goal in itself, and thanks to the way Sky Force handles death, then you are free to go into stages with only progression in mind. Just like leveling up your favorite avatar in an RPG, there is a lot of happiness in upgrading your ship. I might not be the best one to describe it, but I actually felt a little sad once I ran out of upgrades. There is more than happiness to it, part of losing is recognizing what your weakness was during a given mission, so your goal might switch from trying to have the strongest gun, to having a more durable ship or even a stronger magnet to attract stars. Progression and customizability are always nice to have in a game. The relevance of the medals, comes from the fact that they are actually needed to progress the game. Certain stages will ask you to have a specific amount of medals before they are unlocked, which introduces a novel concept for shmups: backtracking. Backtracking is usually a hit or miss feature. Some love it, some hate it. I like to go back to previous stages after I ran out of stages I could feasibly beat. Doing so allowed me to actually feel the power of my ship, by tackling challenges that were once difficult but now felt like a breeze thanks to a stronger ship and improved game sense. Once you get all 4 medals in a stage, you will unlock it in a harder difficulty with a new set of medals to collect. All in all, you will be replaying stages for a long time. Aside from the obvious bump in difficulty, you will also see increased rewards in the form of stars, so if you ever feel like you need to upgrade your ship, then go to harder difficulties and farm those extra stars! There is one thing I can safely say about replaying stages: It definitely made each one memorable. For example, I will never forget that Stage 9 is the one that features the battle over the sea amidst a storm. Or the spider boss that is powered by 4 batteries. There are other unlockables to collect throughout the levels, to ease the tedium of replaying levels over and over: cards and ship parts. Ship parts are pretty easy to explain. By collecting one of the hexagon tokens with a wrench you will unlock a part of a ship. Collect 5 of those and you will unlock a new ship with its own unique abilities and even a unique main gun. For example, the ambulance ship feature a wider angle for the guns at its edge as well as a better ability to rescue pilots. The swift justice features increased speed at the cost of -50% HP. Some do feel more useful than others, and I can’t say if there is an order to their unlock order, so I can only hope that you get the better ones early rather than late. Cards are just fantastic! By collecting a card, you will unlock a permanent perk in some form. These perks come in many different varieties such as increasing your ship’s speed or rescue speed, to more unorthodox ones like “options” that fire alongside your ship and even extra abilities like being able to perform charged shots. I’m not gonna lie, card hunting was perhaps the single most exciting part of my playthrough of Sky Force! Going through the stages with the card hunting ship or using the card radar always felt exciting, as you never knew what kind of card you would unlock next or if you would be able to keep it. Oh yeah, it seems I forgot to mention that ship parts or cards you found on a mission are dropped on death. This adds an extra element of suspense as you do your best to make it to the end of the level in order to keep your loot. Die and you will see the saddest sight as your explosion scatters all your power ups and the cards/parts you were currently holding. Make it to the end of the stage, however, and you will get to keep the card/part, and it will be active forever! Unfortunately, where there are upgrades and backtracking there is bound to be a feeling of grind. I wish I could sugar coat this a bit more, but grinding is grinding, whatever the flavor. The grind is just the beginning of the realization of the subtle wrong decisions that were made in Sky Force. The grind is first felt when trying to tackle a newly unlocked stage and figuring your ship doesn’t do nearly enough damage to beat the enemy formations. It is expected to some degree to have the game stop you from progressing at some point, but when you realize that it isn’t your skill that is stopping you, but rather higher number on the enemy fleet such as HP and damage, then you realize that you are not supposed to be there yet. The grind isn’t usually a long one, and all bad things come to an end eventually. To further exacerbate the dread of the grind, there are harder stages with lower rewards. The last set of stages feature a considerable hike in difficulty, but the stingy part is that the struggle comes from their normal difficulty. Attempting and failing this levels gives very little in the way of stars, making it pointless to retry the level without having an actually upgraded ship. It does stop players from trying to brute force it, but isn’t that what keeps us going as shmup players? That feeling that no stage is too tall for us. Grinding in games is usually a tight rope. At first I spoke wonders of fun of replaying older levels with increased firepower to collect additional levels. This constitutes a fun grind that is driven by a desire to sweep older content. On the other hand, there is the grind which is necessary to complete the last levels. You aren’t going back to previous stages to find additional content you might have missed, you are going back out of a necessity to grow stronger and a game which pigeonhole’d you into the content that is appropriate for your power level. While not as relevant as the rest of the review, I gotta give shoutouts to the bosses in this game. I’ve mentioned in previous entries of this series that I usually like huge organic boss enemies. But my other favorite type of bosses are those multilayered metal behemoths which you must systematically destroy. It all starts easy as you destroy the guns at the wings, and the the auxiliary guns from the sides and so on and so forth. I hope you all have as much fun as I had fighting the different boss encounters! One thing that I like a lot about games is when they give you a very clear set of goals you can accomplish. This is one of the reasons I like achievements so much. Sky Force features a clear set of goals you can strive to accomplish. The first one might be a little obvious, but they are the medals. They might be a different case, as they are actually needed to progress through the game, and perhaps even unlock the final extra levels. The second one comes in the form of milestones. Milestones track your overall number of something, like number of enemies killed, number of power ups used, etc. Reaching a numerical milestone gives you diamonds, and reaching a specific number of diamonds unlocks technicians, which offer special abilities to your ship, with the caveat being that you can only take one into missions. As cool as technicians might be, I was definitely not a fan of how you unlock them. Milestones are fun as a manner of tracking your lifetime statistics, but they become a hindrance if your objective is to unlock the technicians as fast as possible. And you WANT to unlock the technicians because their abilities are pretty amazing! However, when you are tasked with using 1000 items only for a number of diamonds, then it becomes another painful additional grind. Lastly you can track each stage you have completed with each ship. This is as superficial as it sounds, with every ship featuring a list of stages you have completed using said ship. I imagine a completionist might want to use every ship for every stage to fill out the list. Fortunately, you could do so after you’ve accomplished everything else there is to accomplish. I couldn’t just end this review without talking about the music. It is really hard to talk about the BGM because throughout all my playtime, with all the backtracking and stage replaying I’ve done, I felt like I have only listened to 3 or 4 different tracks. Either that, or the tracks have very similar melodies which stop me from being able to tell them apart. The tracks are nice, but it does stress me that there isn’t more variety in the music. But if there is one thing I really want to bring up about the sound department, are the sound effects. 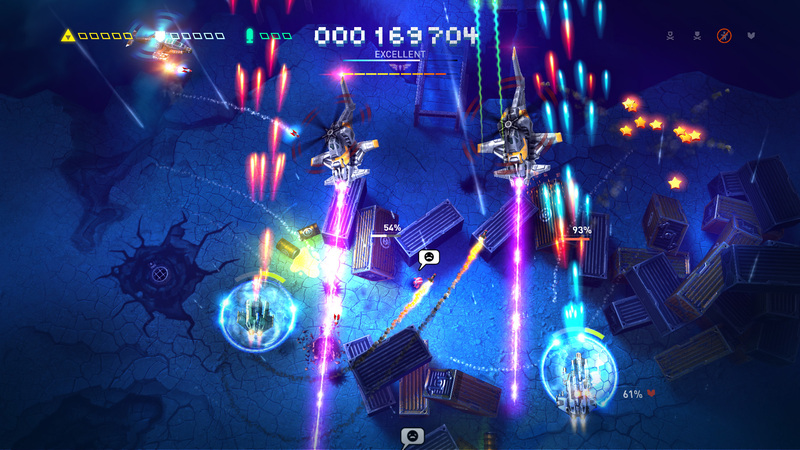 Sky Force is very good at giving huge loud sounds to enemy explosions, but the bullets are a mixed bag of surprises. Many bullet patterns fall on the silent side, and their visuals don’t contrast that well in some stages, leading to bullets you didn’t see or heard coming. It might sound like nitpicking, but when you put it all together it turns into a big problem. Having many bullets, which don’t contrast as much from the background and whose sound effect is either very silent or nonexistent, and having no invincibility is a recipe for “How did I die?” kinds of situations. I do appreciate that long-range sniper style bullets are very loud, as they are also very strong. I didn’t realize this until I wrote this, but I have logged around 20 hours to Sky Force, and I still have many things to do in game. It isn’t without its flaws, as I pointed out previously, but Sky Force features one of the most addicting and easy to pick-up gameplay loops. Every time I boot the game I have a list of different objectives I can accomplish, and that ease is what makes it much easier for me to boot Sky Force from a recently powered Switch as opposed to deciding to play something like Octopath. I do think Sky Force is one of those games which are much better when taken as a handheld game rather than something that should be played docked.